Unlike forex brokers who use MetaTrader as the main platform that facilitates client trading, binary options brokers use the services of web-based trading platform providers with diverse facilities. However, there are also several binary options brokers who create their own trading platforms. Then, which type of platform is the best to use? Why is the Selection of Trading Platform Important? Most of the features provided by broker binary options, ranging from the choice of instruments to the type of trading, start from the platform used. This is due to the many trading features that can be accessed through the use of a broker's trading platform. Due to the use of platforms from certain providers, there are several brokers who have the same trading conditions, but there are also those with different services. For example, the instruments and types of trading offered by Alpari Binary Options and Binary.com are different because the trading platform is also different. It is not only a matter of the diversity of instruments and the type of trading offered, the naming and understanding of each type of trading that is owned is also sometimes different. For example, the high / low trading at Alpari is called call / put, while Binary.com calls it rise / fall. This does not include several variations developed from other basic types of trading such as touch and boundary trading. Instead, traders will find similarities to trading platforms on ETX Binary and HotForex because both of them utilize services from the same platform provider. This is where the introduction of binary options trading platforms can help traders to understand the trading system of a broker more easily. Of the several binary options trading platforms that support trading systems at several brokers, there are 3 main platform providers that are often cited as the best binary options platform providers. The three types of platforms are SpotOption, TechFinancials, and Tradologic. In addition, there are also several trading platforms that are starting to develop and are widely used by several brokers such as MarketsPulse and TradeSmarter. However, not all binary options brokers use platforms from some of the providers mentioned above. There are also several brokers who choose to build their own trading platform systems such as Binary.com. In choosing the best platform, the required criteria can include the quality of the provider, the choice of instruments, the type of trading offered, to the sophistication of platform technology. Founded in 2008, SpotOption is one of the most reliable providers of trading platforms today. With the use of real time quotes from Reuters, SpotOption guarantees convincing market price accuracy. Some large brokers such as Banc De Binary, FXDD, and HY Binary Options are registered as SpotOption clients. Other forex brokers that provide binary options trading features such as HotForex, MFX Broker, and ETX Capital also utilize the SpotOption trading platform to support their trading services in OptionTrade (HotForex), MFX Options (MFX Broker), and ETX Binary. SpotOption claims that at least 200 brokers are registered as their clients. This is also shared by several other sites that review SpotOption as the largest and leading provider of binary options trading platforms today. SpotOption's platform service consists of 150+ trading instrument options, types of trading that include high / low, one touch, and 60 seconds trading, live CS features, trading instructions, news updates, up to various interesting info such as glossaries and FAQs. SpotOption is also a pioneer of the mobile trading platform for binary options. The existence of several complementary facilities such as social trading features, demo account services, and trading monitoring systems that can be translated into various languages ​​make SpotOption's trading platform even more attractive to use. TechFinancials is one of the developing binary options trading platforms. The client of this provider is not as much as SpotOption, but some of them are superior binary options brokers like 24Option, Boss Capital, OptionXO, and many more. The trading platform from TechFinancials allows traders to choose in / out boundary options, a type of trading that is apparently not yet available on the SpotOption platform. There is also a webtrading application that can be operated on iPhone and Android, as well as well-integrated forex and binary options platforms. New TechFinancials was established in mid-2010, but its progress has been almost equal to its predecessor trading platform providers. This condition can be seen from its attractive, efficient and user-friendly interface. When talking about the 3 best binary options trading platforms, Tradologic is always included in this category. Compared to the two platforms above, Tradologic's existence is still unknown by most binary options traders. The display of the Tradologic at a glance platform is similar to SpotOption, but has several additional features such as the types of boundary trading and touch options. The trading platform of this provider can be recognized by its simplicity and easy access. 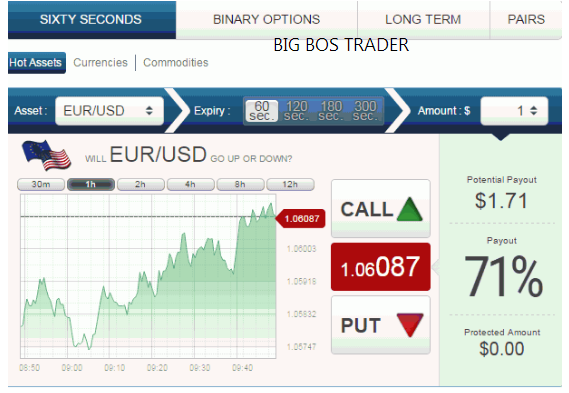 In addition, there are many types of short-term binary options trading and not many technical indicators are offered. Because of this, many assume that Tradologic trading platforms are suitable for beginner traders. Some binary options brokers that use the services of these providers are Regal Options, Option Bit, and Cedar Finance. MarketsPulse provides a binary options trading platform, which is now widely used by various forex brokers with binary options trading features such as FXTrade and Alpari Binary Options, before the broker switches to Binarystation. MarketsPulse also adds Built-in charting and Option on Demand features, as well as platform access capabilities on other devices such as Android and iPhone. Besides Tradologic, MarketsPulse is one of the providers of trading platforms that are recommended for newcomers. The advantages of MarketsPulse in providing a trading platform with an attractive and easy-to-understand appearance make this provider quite convincing to be offered to newcomer traders in binary options. This provider is often considered a trading platform with a promising level of progress. Since being reviewed by binaryoptionex.com in the beginning of 2014, this provider has added more than 20 brokers in its partner list. The trading features on the TradeSmarter platform are also quite varied, because they have expiry time options ranging from 60 seconds, 15 minutes, 30 minutes, 1 hour, and so on. There are also high yield options for the types of trading offered, as well as additional facilities such as take profit, rollover and double up. Brokers such as CallandPut, MyOption, and StartOptions are some of the dozens of registered partners using the trading platform from TradeSmarter. Although not many, there are also several binary options brokers who provide their own trading platforms for their clients. Examples of these brokers can be taken from Binary.com. This broker provides a trading platform that not only has different payout calculations, but also free demo accounts and more specific types of trading. The advantage of the Binary.com trading platform is on a chart that is able to display price movements in real time. Traders can choose for themselves whether they want to take advantage of price charts that prioritize timeframe choices, technical indicators, or their capacity to be downloaded. Binary.com also provides hundreds of trading instruments consisting of forex pairs, stocks, stock indices, commodities, and random. Random instruments are special trading assets made by Binary.com based on price volatility. 1. The trading platform is provided free of charge and without the need to be downloaded. The concept of web trading on a binary options platform should allow traders to trade online without having to download and install any application. 2. Payout offered ranges from 65% -90%. Payout which is lower than 65% will give very little profit, while payout higher than 90% is considered less realistic. This applies to all types of trading except the type of High Yield Options that are provided with payouts of up to hundreds of percent. Please note that this type of trading also has a high risk of trading even though the potential profits are far greater than the usual types of binary options trading. 3. The choice of instruments is not limited to certain types. A good trading platform at least has forex pairs, commodities, stocks, and stock indices offered as trading instruments. The number of instruments from each category can also be an indicator that determines the quality of a trading platform. 4. The trading platform has a good level of privacy security to protect the confidentiality of identity. 128 bit SSL encryption can be a good reference to see if the trading platform has a good security system. 5. There is a demo account that can be accessed to practice trading. The demo account feature is not a service that can always be found in every binary options broker. The platform that allows trading access with demo accounts can be the right choice to be able to practice binary options trading capabilities with virtual funds from brokers. 6. Although not all brokers offer it, a platform that has a refund service for failed options can be prioritized. With this facility, traders will still get a return even though the placed option ends out-of-the-money. 7. The variety of languages ​​offered can be a feature that helps smooth trading. Because binary options trading services can now be reached in various countries, the available language choices can also be taken into consideration to get a good trading platform support. Although some of the facilities mentioned above are generally included in the trading platform, not all brokers will offer the exact trading features. This needs to be adjusted to the broker's policy in providing trading services. Therefore, traders sometimes need to explore more about the trading rules and conditions of the intended binary options broker. Regardless of the broker's policy, the trading platform is generally displayed with almost similar offers of features and interfaces at several brokers. Traders may be able to recognize the similarities of the MFX Options and ETX Capital trading platforms that are equally provided by SpotOption providers. This once again allows traders to be able to recognize the trading conditions of a broker more easily. Just by looking at the type of platform used, traders can estimate the instruments and what types of trading are offered. The same conditions also apply to trading platforms created by the broker system exclusively. To find out the trading conditions of a broker that provides its own trading platform, traders can immediately open the offered platform and analyze the ease and trading facilities of the broker. 0 Response to "Get to know the Binary Options Trading Platform"